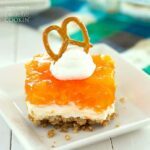 This one-pan Mandarin Orange Jello Salad boasts three layers of pretzels, cream cheese, and jello to make up this potluck favorite! Crush pretzels in a food processor or in a resealable bag with a rolling pin. In a large bowl, mix together crushed pretzels, melted butter, and sugar. Pour into a 13x9 pan and press firmly into an even layer; set aside. Do not substitute fresh pineapple for canned or the jello will not set. *Time given does not include time needed for chilling. This recipe for Tropical Orange Pretzel Salad was printed from AmandasCookin.com - https://amandascookin.com/mandarin-orange-jello-salad/ and can only be printed for education or personal use.